Ah…yes…Hake en Papillote…Of course I know what that means. If Trader Joe’s made love to Ikea, Hake en Papillote would be their golden child. Trader Joe’s typically intriguing take on food shows up with all the hallmarks of the Swedish furniture magnate4 here – an absurdly foreign name, calming minimalist design, and clever European-style packaging. That’s nice, much more refreshing than the usual frozen fish in vacuum-packed polyvinyl approach, but design is not food. My question is, does it taste as good as it looks? Yes it is. And more so. I’ll delve into the details shortly, but first I want to answer the question on everyone’s mind: What the hell does “Hake en Papillote” mean? Hake (rhymes with “rake”) is a smallish, seagoing white fish – most commonly eaten in Western Europe. Spaniards in particular hanker after the hake, snapping up nearly 50% of all hake eaten on the continent. Like tilapia, hake is a text book example of a “trash” fish suddenly becoming a marketplace commodity. Previously sold on the docks as “scrod”, denoting its undesirability and small size, hake has now stepped in as a tasty, white and flaky alternative to more expensive cod or halibut. The problem with all white fish is that they tend to dry out more or less immediately when stuck in a hot oven. This problem can be worked around in a number of ways, but Trader Joe’s struck on an innovative solution with its roots in French, as well as Japanese culture. Cooking “en papillote” literally means “in parchment” in French. Upon opening your box of hake you’ll see this is exactly what Trader Joe’s has delivered on – a tidy box of folded white paper entombing your meal. There are various reasons for cooking in this rather unconventional way, but ultimately the reason is that foods sealed in paper will steam in their own evaporated juices, creating an even more flavorful environment than with traditional steaming (where the water vapor rushes out and away). Cooking en papillote is generally limited to fish and vegetables, so obviously a good choice here, but is historically fraught with difficulties – How is the meal best wrapped? How is it kept closed as it steams? How can it be opened without scalding tender fingers? As a result, most en papillote cooking, even at fancy restaurants striving for haute cuisine, use aluminum foil for the task. Trader Joe’s would have none of that. As stated on the box, and self-evident upon opening the package, they have devised a brilliant, two-piece, origami box that neatly wraps up the food, holds it safe, and allows for easy opening – either in the kitchen or directly on the plate for that “ooh-la-la” feeling. So it’s a fancy take on something old, that’s fine – but is it worth all the paper-folding? Simply put, Trader Joe’s should start packaging all of their frozen fish like this, because I can’t get enough. 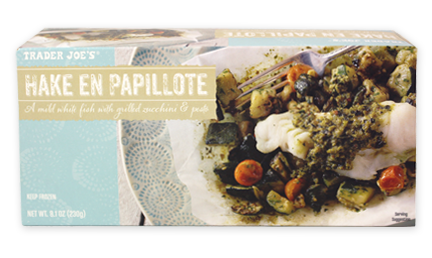 Hake en Papillote is, without a doubt, the tastiest frozen meal I’ve ever had from Trader Joe’s or, in fact, ever. Now, I’m not necessarily a fish person – I’m entirely satisfied to go months on end without tasting the flesh of the cold-blooded ichthyoid – but Hake in Papillote might just change my mind. Conceive of a light, flaky fish in a tasty, savory nutty pesto with a spring vegetable melange that pleases the whole tongue and you’ve got it. Often, I find that white fish tends to taste particularly “fishy”, though whether that’s because of something inherent in the fish or my own poor cooking I don’t know. In either case, the preparation here takes care of that for me and the hake has a clean, fresh taste without a hint of fishiness. The cherry tomatoes and zucchini are augmented elegantly by the delicious, but not overwhelming, pesto, and the steam-cooking process ensures that all these flavors come out vividly. 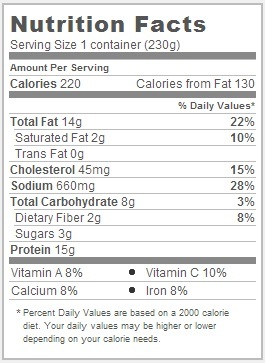 And let’s not for get the nutritional information – Hake en Papillote offers a complete entree that’s actually healthy. 14 grams of fat, 8 grams of carbs and only 220 calories make it the perfect, tasty meal for all but the most ascetic dieters. It is a brilliant work of food engineering – from packaging, to presentation, to taste, to price. I try and maintain a philosophical outlook on the comings-and-goings of Trader Joe’s many products – to become too attached to any one product at TJ’s is to set yourself up for heartbreak – but this is one product whose eventual absence will leave me utterly crestfallen. Would I Recommend It: Yes, firmly and definitely. Would I Buy it Again: I’ll be picking this up on a weekly basis. Final Synopsis: The best frozen fish you’ve ever had, and a reason to believe in a hopeful future. I’ve been baking fish “en papillote” for months now using parchment bags made just for that purpose and really enjoying the variety of results I have gotten by throwing in different veggies and spices with the white fish. I was intrigued to see TJ have their own “pre-fab” version of the dish, and thanks to your review, will be picking it up on my next visit there. I definitely agree. This (new?) sku at TRADER Joes is my favorite Frozen ready meal! I can’t agree with you more, I tried this for the first time today and I’m in love! The origami parchment box had me squealing like a kid at the circus and then I tasted it…. heaven! I’m so happy that I bought more than one! I just tried it and the entree, paper and all, burned after 3 minutes. Smells awesome in the office…I usually love TJ’s meals, but will not be buying this again. go ahead and give you a shout out from Kingwood Tx! Just wanted to tell you keep up the excellent work! I set my microwave for 5 min., which was between the suggested times in the microwave and it incinerated the meal, the paper and now I will be smelling this burnt odor for days. The Arroyo Pasadena CA store said this has been discontinued.